Once you wake up late, you’re rushing to get out of the house. You throw on clothes from a pile in your laundry basket, brush your hair as best as you can in 30 seconds, and grab the mouthwash instead of taking the next few minutes to brush your teeth. We’ve all been there! But, mouthwash doesn’t just refresh your mouth—it’s designed to boost your oral hygiene alongside a thorough brushing and flossing regimen. Your Waco dentist wants you to know how this “cherry on top” of your dental routine can really bring your dental hygiene to the next level when used correctly. Debris provides the perfect breeding grounds for bacteria to proliferate. Food debris can damage your teeth. Acidic debris can wear away the enamel on your teeth. Being infused with alcohol (antiseptic mouthwash) that kills bacteria. Being infused with antibacterial products (antimicrobial mouthwash) that wipe out bacteria. Including eucalyptol, methyl salicylate, thymol, and menthol (ingredients that reduce bacteria production). 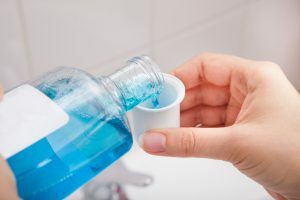 Antiseptic mouthwash may leave your mouth drier than before from the alcohol found inside it. When your mouth is lacking saliva (a natural antibacterial substance), the bacteria in your mouth can begin to fester once again if you don’t stay on top of it. It’s important to increase your water consumption to keep your mouth hydrated. If you have common stains from coffee, wine, and/ or tea, mouthwash may be able to help you lift that discoloration over time. If brightening surface stains is your goal, speak to Dr. Cofer about which mouthwash may be best for you. Premier Family Dental also offers professional teeth whitening that can achieve those results in a much shorter time! Ask us about how our cosmetic treatments can help you. Need mouthwash advice? Feel free to contact our Waco office for the best insight on which mouthwash will be the most beneficial to you. Dr. Cofer will consider your oral health and determine the best product and plan for you during a scheduled appointment. by: Dr. Rick Cofer at July 25, 2017 .